The leukoma is obvious. The pupil shows a flattening of its margin from 2 to 4 o'clock - the pupil margin is a straight line in this zone. This is pathognomonic of an iridodialysis. 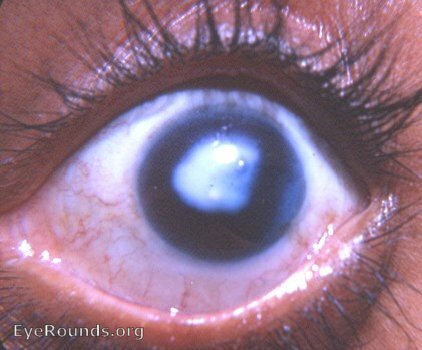 Careful examination will reveal the iridodialysis from 2 to 4 o'clock between the torn edge of the iris and the limbus - the area is slightly blue.